In just three days, Kan Shao conducted a risk assessment workshop at the IU China Gateway that could result in the development of life-saving government regulations. 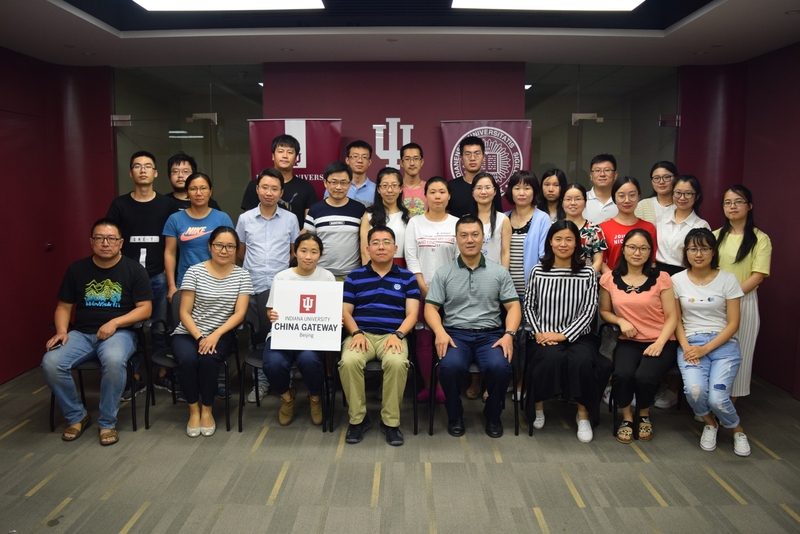 When Shao, an assistant professor in the Indiana University School of Public Health-Bloomington, held his first workshop in IU’s gateway facilities in Beijing last year, it was filled to capacity with professionals and graduate students from research institutions, NGOs, and universities in China. They were trained to assess health risks by evaluating the level of toxicity of chemicals in the environment and the likelihood that people will be exposed to those chemicals. Kan Shao poses with attendees of his risk assessment workshop that was hosted at the IU China Gateway last year. This kind of training is in high demand in China. New laws and food safety standards have recently been established there to protect the population after contaminated milk powder caused many young children and babies to be hospitalized in 2008. The risk assessment training workshop was not only beneficial to participants; Shao also gained valuable insight into China’s scientific community and its areas of focus when it comes to chemical risk assessment. He discovered that in China there is less emphasis on evaluating a chemical’s toxicity than in the United States. “When they reach the step of establishing regulation, they really need to understand how toxic the chemical is, especially at different dose levels,” he said. Shao also expanded his network in China. 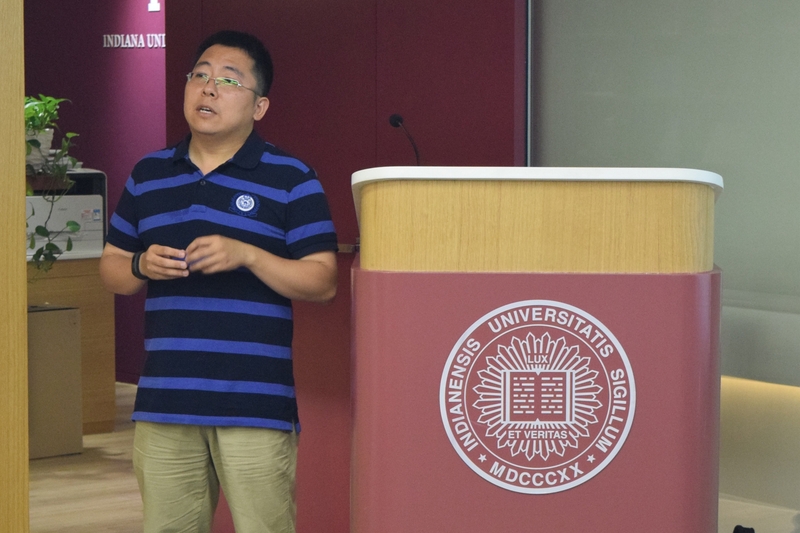 Kan Shao speaks during a risk assessment workshop at the IU China Gateway in Beijing. “I did establish a lot of relationships with some of the participants from different institutions,” he said. Because of the workshop’s success, the new relationships Shao established and the need for more training in this area, Shao is holding a similar workshop with 50 participants this month in collaboration with the School of Energy and Environmental Engineering at the University of Science and Technology Beijing. While in China, Shao will also seek help from the IU China Gateway office to continue networking with higher education institutions and organizations in the region and to conduct his own research, which has been supported by a grant through IU’s President’s International Research Award. The grant program sponsors international collaborative research projects that engage one or more of IU’s Global Gateways and the communities they serve. In Shao’s case, the grant funding allowed him to purchase supplies and materials needed for his workshops. It has also supported his travel to Beijing, where he is conducting research to evaluate the health risk imposed by arsenic exposure through rice consumption. Arsenic is a naturally occurring element found in soil and water and then absorbed into crops, including rice and apples. Exposure to it cannot be completely avoided. In the United States, exposure to arsenic through food or water is regulated by government agencies, and those regulations are informed by researchers who estimate the risk of exposure to arsenic through the foods we eat. Rice is especially good at absorbing arsenic from water and soil, and it’s not uncommon for people in China to eat rice at least twice a day. Continual exposure to arsenic over a long period can cause lung, bladder, and skin cancer, as well as cardiovascular disease. Shao is conducting research on the levels of arsenic in rice and the rate of rice consumption rate to assess the human health risk in China. Based on the data he collects and his estimation of the risk, Shao’s research could provide recommendations for Chinese regulatory agencies on how they might regulate the concentration of arsenic in rice. “There is a regulation currently in place, but it's still quite risky,” Shao said. Before Shao received the grant to use the gateway office, his research was mainly theoretical. Now, he is able to use his risk assessment research to focus on solving a real problem. 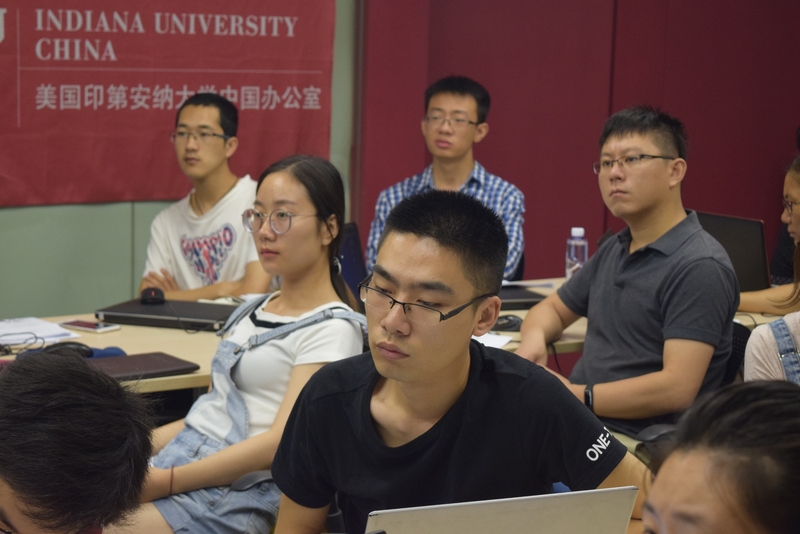 Attendees to the risk assessment workshop included professionals and graduate students from research institutions, NGOs, and universities in China. “Without that grant, I probably could not start this project, which I think can have a lot of potential after the initial data I collect from the study,” he said. Because the support has been so beneficial to him, Shao has already helped a colleague who was interested in applying for the President’s International Research Fund. “I really appreciate the opportunity that the gateway office and program have given me, which I think not only broadened my research, but also helped me build connections and gather necessary resources for my research project to succeed,” he said. The IU China Gateway office in Beijing is one of five in IU’s Global Gateway Network, which also has offices in Europe, India, Mexico, and Thailand.